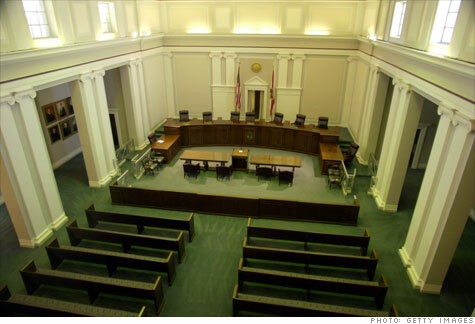 NEW YORK (CNNMoney) -- Florida desperately needs more foreclosures ... or its court system does, at least. The steep drop in foreclosure filings in recent months has opened a $72.3 million deficit in the Florida court system's budget. The financial situation is so dire that the chief justice has asked Gov. Rick Scott to temporarily transfer $42.5 million to the courts from other funds. Otherwise, the courts will have to impose "extensive furloughs" of its personnel, Chief Justice Charles Canady wrote to Scott last week. "Such furloughs would cause a severe disruption in the functioning of the courts," said Canady, adding that he's already implemented a freeze on hiring and operating budget expenditures, which will close the rest of the gap. The governor's office agreed Tuesday to transfer a total of $14 million from trust funds for mediation and arbitration and for court education. This will keep the courts operating through April. And it will give Scott's team time to understand what led to the deficit and how it can be resolved, wrote Budget Director Jerry McDaniel to Canady. They will then decide whether to shift $28.5 million in non-court funds to the judicial system. In 2009, Florida lawmakers changed the court system's funding system, making it dependent on filing fees rather than money from the state budget. Some 80% of the court's $462 million budget comes from filing fees. And the courts, which have been swamped with foreclosure cases in recent years, projected that 77% of their fees would come from real estate filings this year. But foreclosure cases have dropped precipitously since last fall, when mortgage servicers were caught up in a paperwork scandal. Many halted or slowed their foreclosure filings after it came to light that they were submitting improper documents to courts nationwide. In Florida, foreclosure filings fell to 8,205 in February -- the lowest since October 2006. Filings peaked at 38,371 in October 2008. The court system estimates that foreclosure filings will rebound in the next fiscal year, which starts in July. While Canady says he has some reservations about that projection, it will resolve the judicial branch's fiscal crunch. The chief justice said he is also working with state lawmakers to lessen the court's reliance on foreclosure filing fees.